With the cold and the snow, I've been wearing my new boots to the office and then changing into shoes once I get there. That way, if I have to stop for something and there's lots of snow around, I don't get my feet wet. As work was winding down last night, I removed my shoes and put on my boots. Once, home and the recycling dragged to the curb and the mail retrieved, the boots were removed and I went to put the shoes away on the shoe tree in my bedroom. That's when I saw it. Oh man, this is the left shoe. It's coming apart at the stitching. Quickly checking the right shoe, I found this. 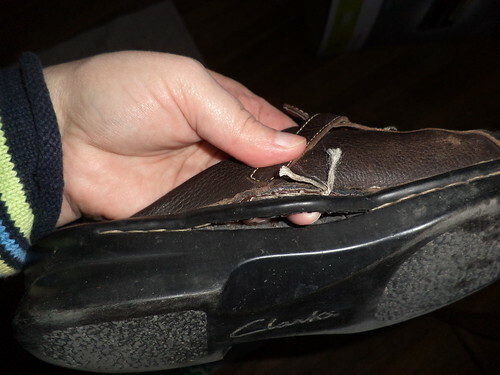 This was my first pair of Clarks shoes. This is the pair that sold me on how good, how comfortable these shoes are. I have had this pair for, oh gosh, maybe 8 years? I'm not sure how long. With RA sometimes affecting my ankles and then, by extension, my feet, my decision to invest in Clarks has paid off substantially. Yes, they are more expensive than something I could get at Payless, but for comfort, they are well worth the price. You can see that the sole is still in exceptionally good condition and all that's wrong is that the stitching holding the black piping to the sole and the upper has come apart. There is a cobbler in downtown Glen Ellyn. I've taken a lot of stuff to him over the years. There's probably another 8 years, at least, of use left in these shoes. I think I need to drop them off. Yes, when I discovered this, I had a momentary thought that I should just replace them. They need to be polished, badly. I've had them a long time. But, beyond the broken stitching, there is nothing wrong with them. As long as I can fix them, it's stupid to spend money on a new pair of shoes. 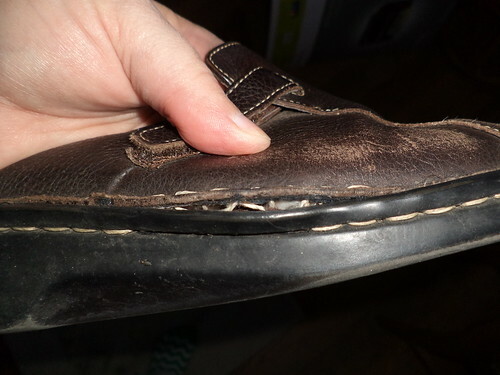 If the sole or the upper was cracked, that's a different matter, but stitching. Pffft. So, next week I have a couple days off for doctor's visits. I'll add dropping these off at the cobbler to my to do list. Oh look. Across the street is The Bookstore. I can pop in and say, "Hi".